Say good-bye to your hangover in 60 minutes or less—but it’ll cost you. 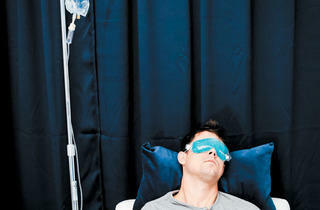 Photograph: Allison Williams A patient receives a hydration therapy treatment at Revive. I arrive to my Saturday-morning appointment at Revive Hydration Clinic, a new spa in River North, with a sweatshirt tossed over the shirt I’d slept in, my hair in a tangled ponytail, my teeth barely brushed and nausea swirling in my stomach. I am that ugly word: hungover. But Revive owner Dr. Jack Dybis, also a surgeon at Evanston Hospital, isn’t fazed. Treating Chicago’s worn and whiskey-weary is part of his business model. 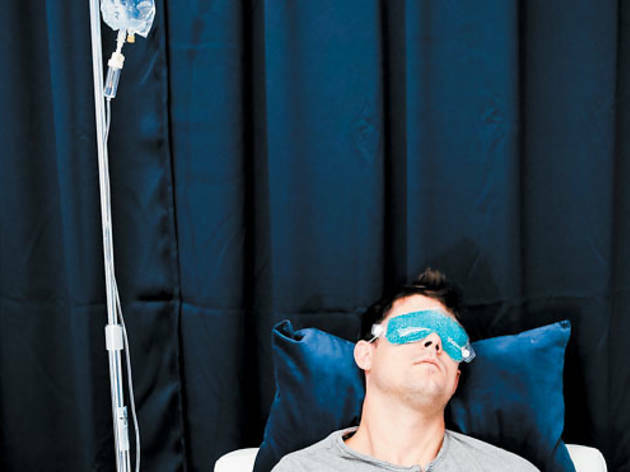 I called Revive a spa, but as Dybis explains, it’s really the merging of a spa and an ER—a place equipped with white sofas, coconut water, eye masks, noise-canceling headphones and free Wi-Fi, yet staffed by licensed medical professionals ready to stick you with an IV without blinking an eye. ER and IV, of course, call to mind broken limbs and bed-ridden patients, but Dybis says to nix the association. IVs are the simplest form of hydration, he says, used by everyone from athletes prepping for a big game to surgeons feeling under the weather. Before I can bolt (needles? Is this guy for real? ), he hands me a medical form to fill out. The clinic’s also designed for athletes, as well as cold and flu sufferers, jet-lagged travelers and anyone else who may be dehydrated, but I skip straight to the hangover symptoms, checking off nausea and dry mouth. Dybis prescribes a liter of Lactated Ringer's solution, a saline solution which contains electrolytes and minerals, supplemented with vitamin B and Zofran, a common antinausea med. A friendly RN named Gina takes my blood pressure, swabs my arm and sticks me. I barely feel the needle. In the 20 minutes I spend watching The Hangover 2 (irony appreciated) on Revive’s TV, my stomach moves from rejecting the idea of food to grumbling for brunch, a sign my hangover has dissolved. It’s a luxury to be able to fit in a burger at the Publican and a 45-minute Spin class in the time I normally would have been dozing in and out of bad reruns, but come my next hangover—undoubtedly New Year’s Day—I’ll probably just sleep it off: Revive’s $99 price tag is unfortunately too steep to make this a regular fix. 222 W Ontario St, suite 450 (312-350-1822, revivechicago.com). Mon–Fri 7am–noon; Sat, Sun 8am–4pm; no appointment necessary, but call at least a few minutes before walking in.